I have been working quickly, as quickly as I can, to get things done. Unfortunately, this time of year makes everything go slower. There are so many things happening. I am sure you feel this way too. So, here are my goals for the next week (let's take it a week at a time, and see what happens). 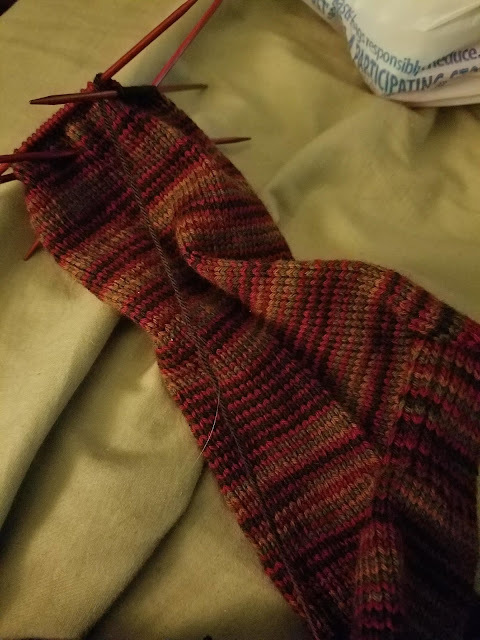 First, finish this sock. It is for Christmas, and needs a mate, but first things first. Second, finish my Iced. We had a cold snap, and I could have used a heavy cardigan. Another one is sure to happen, as it is that time of year. Third, blog at least 3 times this week, to keep myself on track and honest. We all need a little more accountability. What are you working on for the busy season?